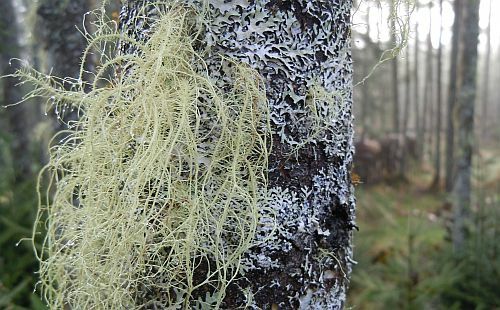 Light grayish green lichens known as Old Man’s Beard hang from the trees in the forests. Sometimes blown onto the ground on windy days, to the touch, these lichens are usually soft but sometimes stiff in dry weather. A few are streaked with brown. Old Man’s Beard is frequently found in clean, moist environments such as boggy woods. Though it prefers to cling to coniferous trees in old growth forests, it also hangs from the younger birches in my backyard. Sensitive to air pollution, it’s often found with other types of lichens, such as the foliose lichens shown below. Canada’s native people harvested Old Man’s Beard long ago and added it to their diet. It can be steamed or dried and pummeled into a powder. A strong antibiotic, it was also used to prevent infection and gangrene from setting into external wounds. A thousand years ago, Old Man’s Beard was already being used as a medicine to treat lung cancer. It’s still used today as a treatment for tuberculosis in China as it contains usnic acid. The antibiotic properties of Old Man’s Beard make it an effective treatment for fish infections in ponds and aquariums. Yellow warblers seek forests where the Beard is present as they consider it an indispensable construction material in building their nests. A french fairy tale, LA BARBE DE NAIN by Marcelle Vérité, explains that the beards once belonged to elves. Long ago, it was customary for these kind, cheerful creatures to arrange bundles of deadwood on the forest floor as a gift for mankind. 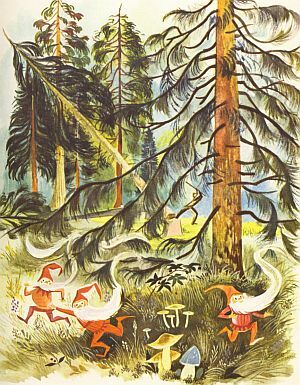 But when men greedily began to cut down live trees, the elves hastily fled to remote mountain peaks, snagging their beards on branches in the process. The lost beards can be found in forests to this day. Considering the wonderful medicinal properties of these beards, their elvish origins are no surprise to me. 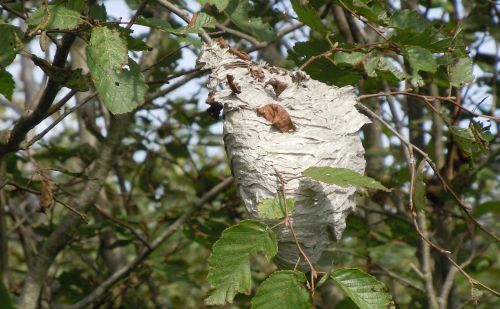 A hornet’s nest <Potential trouble> ~ I don’t think anyone would care to poke this nest, even with a ten foot pole. 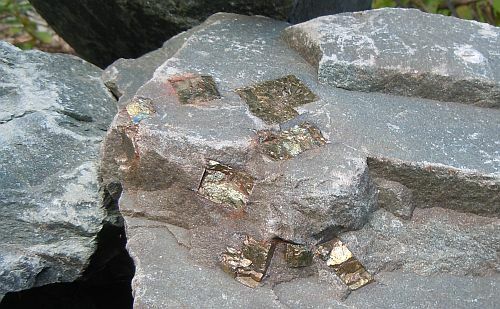 All that glitters is not gold < Attractive appearances can be deceiving> ~ In this photo of rocks found along the Salt Marsh Trail, it’s pyrite aka fool’s gold. 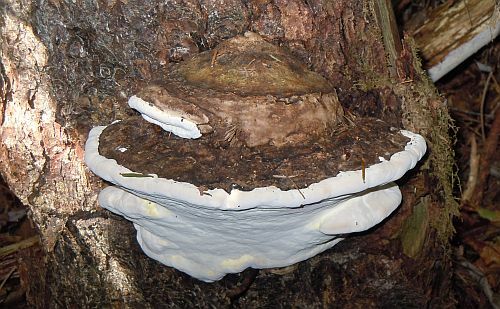 To mushroom <To grow or develop at an exponential rate> ~ This enormous shelf fungus seems to be growing more quickly than normal on a decaying tree in my yard. It’s about a foot in width, an unusual find in my neck of the woods. Thanks to Karma at Karma’s When I Feel Like It Blog who challenged her readers to use photographs to illustrate three idioms from the English language. A photo showing ‘Hallowe’en’ was also part of her request. To me, Hallowe’en implies something scary, and to many people, next to death and public speaking, the scariest things on the planet are spiders. 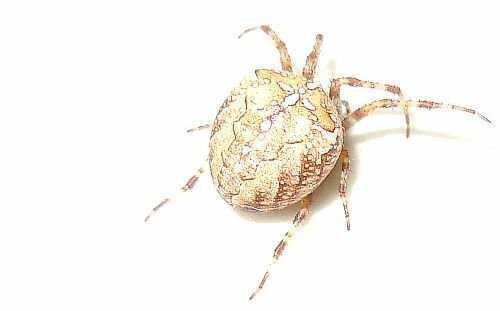 Living near boggy woods, we have a lot of spiders near our home, especially around Hallowe’en. Sometimes they cross the threshold uninvited and visit us indoors. This one is probably the biggest I’ve ever found in the house. After the photo shoot, it was promptly sent on its merry way outdoors while I cleared out the cobwebs. If you’d like to participate in Karma’s idiom challenge, you have until October 31st 2011 to do so. April showers bring mayflowers. Sometimes in May… sometimes in April. It’s raining today which is good news for all things green and growing. 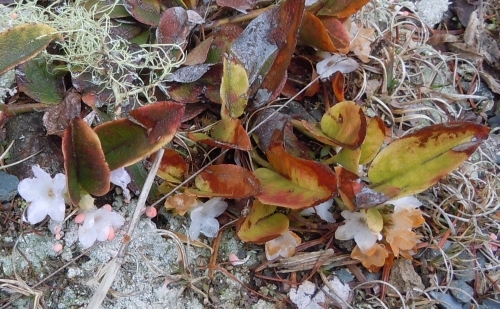 Mayflowers (aka trailing arbutus ~ Epigaea repens) are among the earliest native blooms to appear in Nova Scotia. Half-hidden on the edge of the woods, their leathery leaves may look ragged and browned in spots, but the flowers are nonetheless fresh and pristine. Their petals fade from light pink to white as spring progresses. 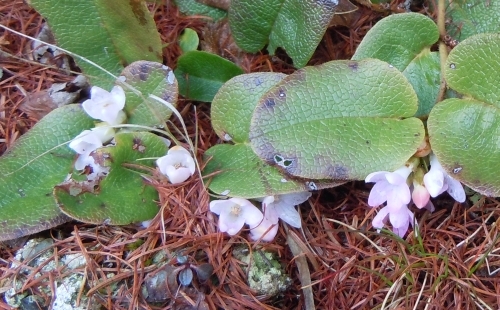 Mayflowers enjoy the moist, acidic environments that are typically found near bogs. They are also shy plants, with a preference for shade. Over a century ago mayflowers were designated the floral emblem of Nova Scotia. 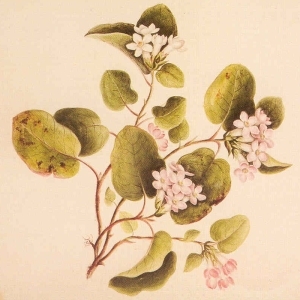 Found throughout most of eastern North America, this native evergreen plant is now considered an endangered species in Florida and vulnerable in New York. Unbeknownst to many gardeners who unsuccessfully try to transplant them, the roots of mayflowers have a secret relationship with fungus. In this mutually beneficial liaison (also known as a mycorrhizal association), fungi gain direct access to carbohydrates through the roots of the mayflower. 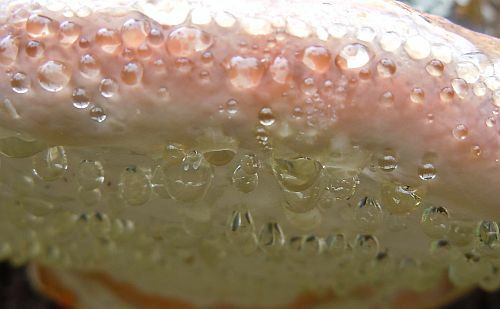 At the same time, the fungus makes the mayflower more resistant to disease and drought. In the language of flowers, mayflowers mean welcome. Welcome to Nova Scotia. Welcome to spring. The image of mayflowers at top left was scanned from a postcard I purchased at the Nova Scotia Museum of Natural History over two decades ago. I photographed the mayflowers just a short walk from the bottom of Flandrum Hill Road last week. For every beauty, there is an eye somewhere to see it. For every truth, there is an ear somewhere to hear it. For every love, there is a heart somewhere to receive it. 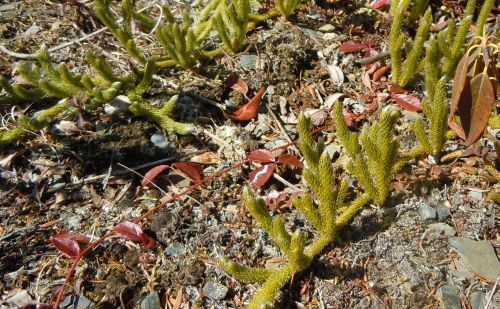 Though it’s now barely noticeable underfoot, millions of years ago, the creeping club moss shown above grew much larger. The swamps that were filled with these club moss trees during the Carboniferous period were eventually transformed into the coal that’s mined today. Did a flicker make this hole? 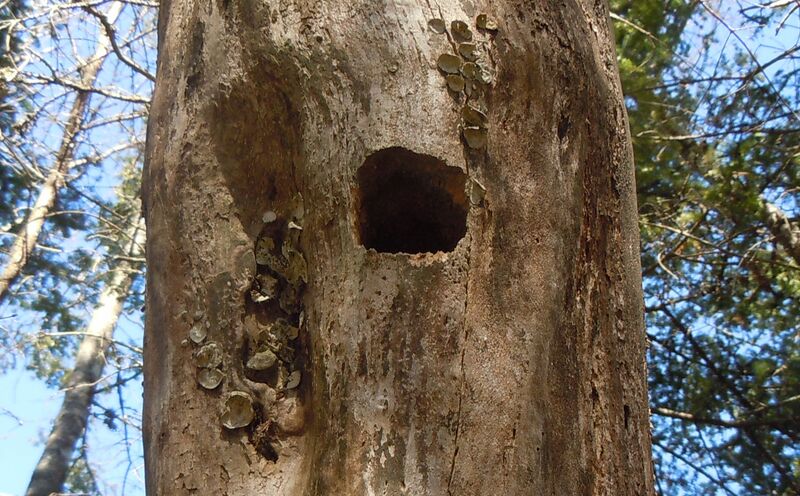 Standing dead trees (snags) in old growth forests offer places for wild creatures to nest. If flickers nest here this year, they’ll be looking for tasty ants, their favorite food, to feed upon in the neighborhood this summer. Who treads the delicate stairs of this stair-step moss? Utilized in the past as a covering for dirt floors and a gap filler between the logs of log cabins, it’s now being studied for its anti-bacterial properties. 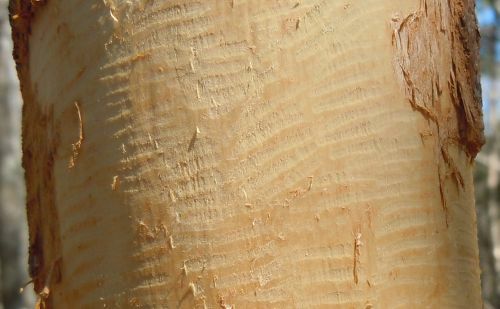 The porcupine teeth marks on this tree reveal a delicate pattern. 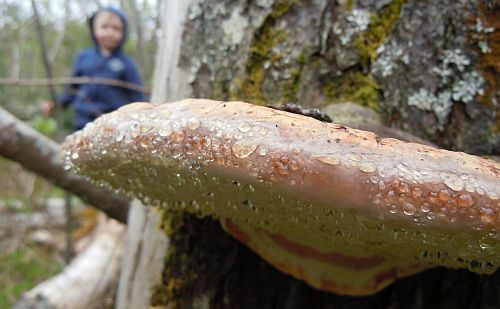 Could we be missing a woodland delicacy by not including inner bark in our diet? It might be worthwhile trying in a survival situation. Could this delicate creeping vine be partridge berry? 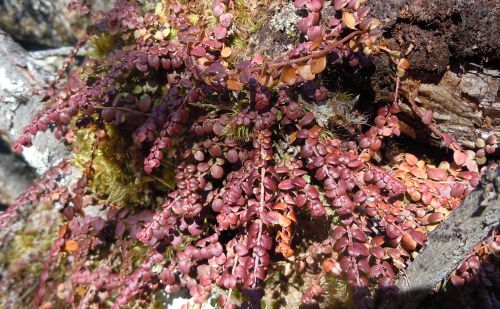 Its rich red hue will turn to green later this spring when it will blend in more with the mosses surrounding it. 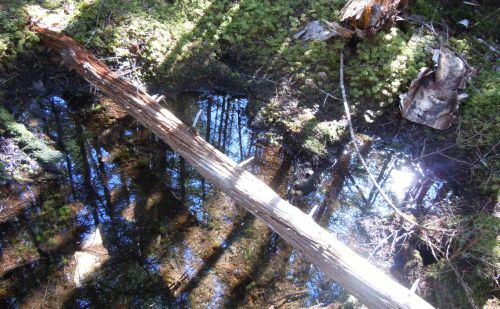 The forest is reflected in a woodland pool that will sustain a diversity of life before it dries later this summer. Do the faeries sit on this log at the end of day to relax and chat about the day’s adventures? 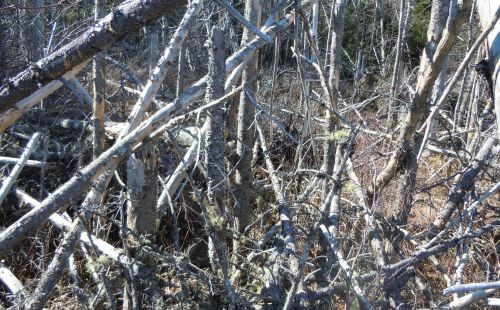 These photos were taken on a most enjoyable walk in the woods yesterday with my friend Sybil of Eastern Passage Passage who posted a very different version of our adventure on her blog 🙂 You can read her post here. If there was the slightest chance that a rare organism existed in your neck of the woods, would you try to find it? 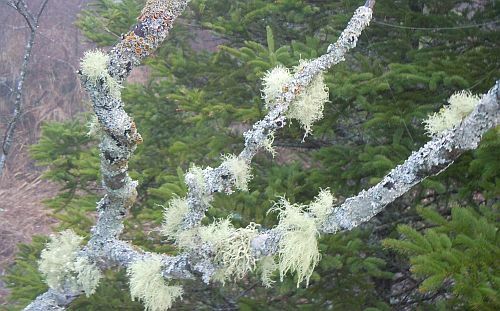 The Boreal Felt Lichen (BFL) is considered a critically endangered species globally. Acid rain and forest disturbances have threatened its existence on both sides of the Atlantic. Once found in Sweden, Norway and New Brunswick, it is now believed to only exist in Nova Scotia and Newfoundland. The BFL possesses the remarkable ability to convert nitrogen in the atmosphere into a form that can benefit forest plants and animals. Like many of the earth’s rare organisms, it finds its home in forests that have not been disturbed by man and simply left in their primeval state. The color of the BFL varies from brownish-grey to bluish-green depending on its age and how moist or dry it is. Velvety above, dried fronds curl to reveal a whitish edge. Brownish-red berry-like nodules may be found on mature specimens. 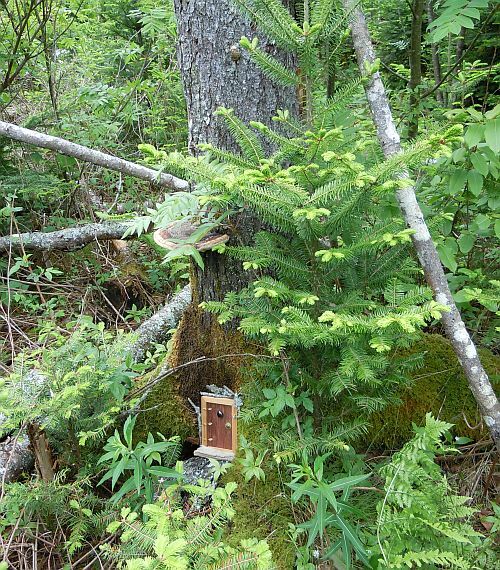 BFL are usually found on balsam firs in the presence of the liverwort Frullania tamarisci. The forest is within 25 km of the Atlantic coast. 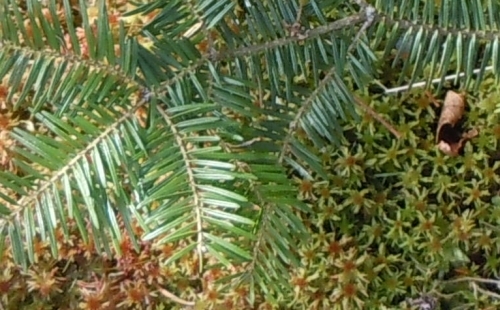 Mature balsam fir trees grow in the area. There is a North facing slope. 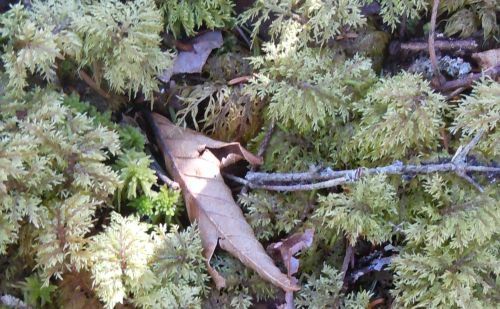 Sphagnum moss is found in the nearby wetland. Ferns (cinnamon ferns esp.) are found among the grasses. Red maples and black spruce trees are also found growing in the area. Although I’ve noticed all of the above qualities in the boggy woods behind my home, I’ve yet to find any BFL. But I’ll keep looking. You might like to look for them in your neck of the woods too. 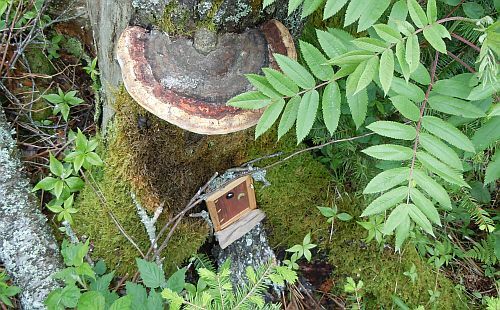 Looking for rare lichens might not seem very exciting at first, but it’s an excellent way to spend an afternoon with a friend or a child in the woods. 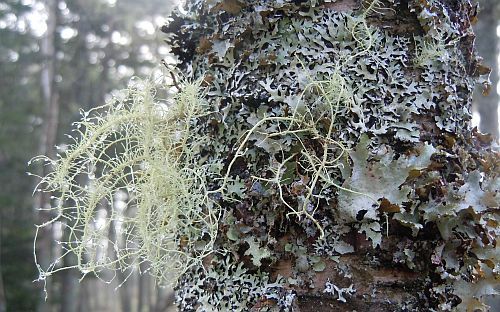 Once you try it, you’ll never look at a lichen-covered tree or branch the same way again. 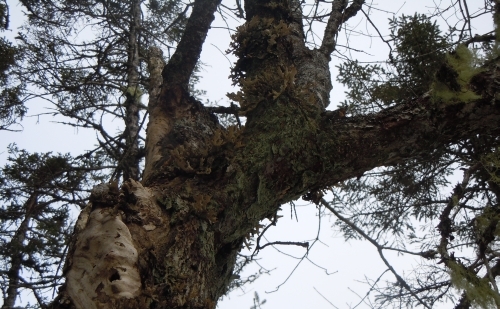 If you would like to learn more about the Boreal Felt Lichen, please visit the Newfoundland Lichen Education & Research Group’s Erioderma website. It features the most excellent images of the BFL presently available online. Many thanks to Eugene Conway of the NLERG for granting permission to use the two images of the Boreal felt lichen shown at the top of this post. For further related reading, see The Benefits of Lichens on Trees and Don’t Clear Your Woodlands.